Sometimes those of us who work (out) hard, also like to play hard by hitting happy hour for a few drinks with colleagues after a long day. Do those small indulgences derail your progress, or can you actually find a balance? The good news is, yes, you can have both. But it requires following a few smart rules, especially if you workout and get your drink on right after. And you don't have to feel bad about boozing after sweating, whether or not it's OK is a classic nutrition question that comes up all the time. And the short answer is: If you’re going to do it, just do it the right way. Though it may feel like you’ve earned it, there are dos and don’ts of boozing post-workout so you don't undo your previous efforts at the gym. Here are five must-follow rules when drinking alcohol after breaking a sweat. Read on to finish off the season with some epic summer days! During exercise you use something called glycogen, which is stored carbohydrates. You also break down muscle. Of course, you also sweat, which means you lose fluids and electrolytes like sodium and potassium, among others. To add insult to injury, alcohol itself can dehydrate you, just like exercise. 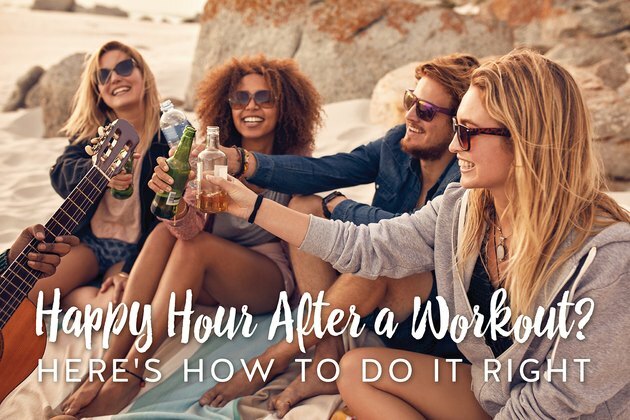 So that being said, here’s the first “rule”: Drink water during your workout, then drink one to two cups of nonalcoholic fluids post-workout before you hit your favorite happy-hour spot. This can be as simple as water! But even better might be something like chocolate milk so you get your protein and carbohydrates as well. Genius. Lastly, when you are at happy hour, follow each alcoholic drink with one glass of water. Think of it as a chaser! If you’re sweaty and tired from your workout, then the alcohol you will consume is going to further dehydrate you. You’ll be in store for a rough morning the next day and potentially sabotage your workout routine. The simple tip of hydrating will set you up for success! In addition to replenishing lost fluids, carbohydrates and protein also need to be replenished after your workout. Similar to rule 1, it will help you feel your best the day after a workout and drinking, giving you motivation to make it to the gym the next day — if you're that motivated. 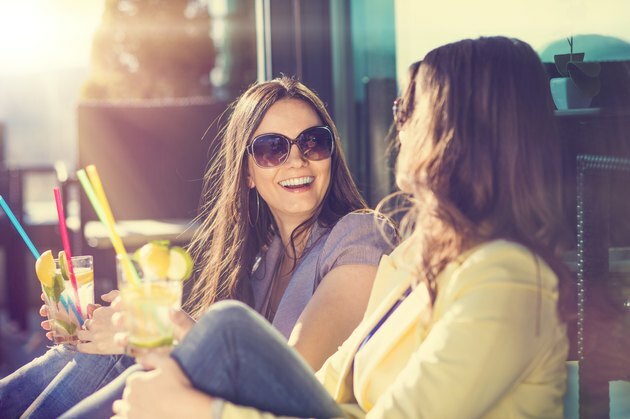 In addition to the nonalcoholic fluids suggested before, it's a wise ideas to eat or drink carbohydrates and protein before downing any adult beverages. Eating protein or carbohydrates before you drink can help control blood alcohol levels. Plus, as a general rule of thumb, try to always drink with something in your stomach. Protein and carbs act like a base layer and may keep you from getting too drunk, or drinking too much. This will especially help supply you with energy for a wild night out and hangover prevention. What should you eat? It can be solid food (like Greek yogurt with a piece of fruit, or it can also be something easy and convenient, such as a high-protein milk shake (such as Core Power, which offers a combination of carbohydrates and protein) or even simple chocolate milk. Now that you’ve rehydrated and enjoyed some quality nutrition, what then do you choose when you’re out with your friends? Calorie for calorie, standard pours of different types of alcohol — wine, beer or liquor — are quite similar (100 to 150, calories, give or take). Of course, if you add a mixer like juice or soda to the alcohol it could quickly turn into a 400-calorie sugar bomb which is a total bummer. Avoid the mixed drinks — they go down too easily and add up way too quickly anyway. Maybe you’ve also heard from a well-meaning friend that beer is good after a long run. Well, it’s liquid, so of course it will temporarily hydrate you. But remember, it’s still alcohol, so the temporary rehydration will be brief. An ice-cold brewski may sound refreshing after a hard workout, but, speaking from practical experience, unless you’re very disciplined a few of these may go down a bit too quickly. Wine or liquor neat (i.e., without a mixer), however, are usually sipped and savored more slowly, leading you to drink less overall (win). So enjoy a nice glass of wine or vodka that you sip over the course of about 30 minutes, and then "chase" it with water before considering a second drink. Keep in mind that to everyone around you vodka with club soda and just club soda look the same in a glass. So if you want to feel like you’re apart of the party without the booze, just try sipping on a club soda and lime sans vodka. No one will know the difference! And you'll feel better the next day (win - win). It may seem silly, but this rule will help you moderate your number of drinks. 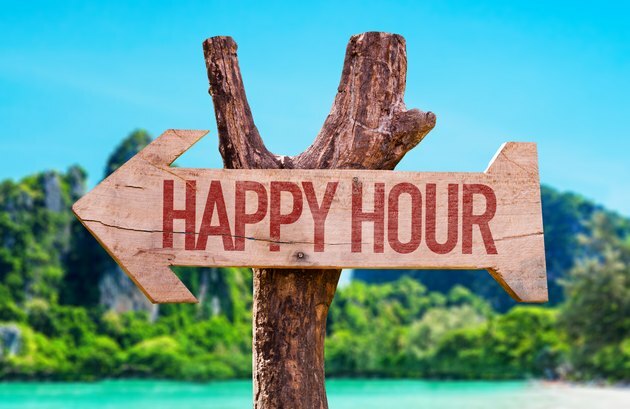 Besides, the purpose of happy hour is to connect with others, not slam as much half-price alcohol as possible. Right? Whatever drink you choose, focus on the connection and social aspect of the event, letting alcohol be part of the equation instead of the other way around. And if it is the main focus, then consider different colleagues for your Friday-night hangout. Finish off the night with another “night cap” of one to two glass of water before bed. 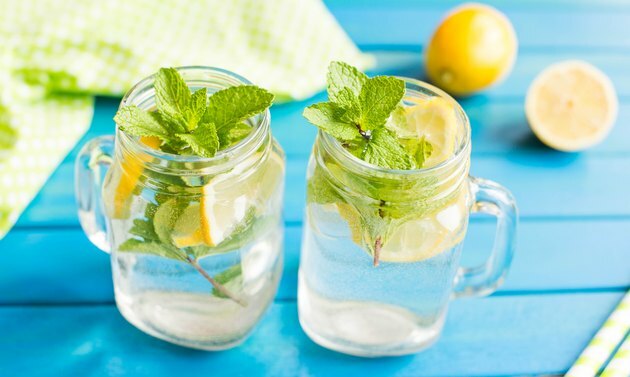 This is some commonsense hangover “prevention.” It essentially helps rehydrate your thirsty cells so you wake up feeling refreshed and ready to take on the day — instead of letting the day take on you. Are you guilty of downing a few after a workout? Now that you've learned the safest and healthiest way to drink alcohol after working out, will you be more mindful? What are your favorite protein snacks to eat or drink right after a workout?